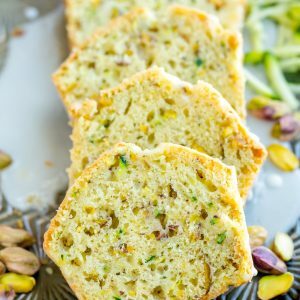 Lemon Pistachio Zucchini Bread is a fun twist on zucchini bread that's positively addictive! Try it with a sweet lemon glaze as a dessert bread or dive in as is for a tasty breakfast bread to kickstart your day! Spray 3 mini 6 x 3.5 x 2 inch loaf pans with cooking spray (I use my favorite avocado oil spray) and set aside. Using a different size? See notes for tips. Combine flour, baking soda, and salt in a medium bowl and mix. In a large bowl, beat together eggs, sugar, and oil. Stir in sour cream, lemon juice + zest, and vanilla. Sift your flour mixture over the wet ingredients and stir with a fork until just barely incorporated. Gently pat your zucchini dry with a paper towel then fold it into the batter along with the pistachio nuts. Pour into mini loaf pans and place atop a baking sheet on the center rack of your preheated oven. Bake for 28-30 minutes or until a toothpick inserted to the center of the loaf comes out clean. Allow to cool in the pan for 10 minutes then remove + transfer to a wire rack to finish cooling. If adding the optional glaze, once bread is mostly cooled, whisk together your glaze, starting with just 1/2 TBSP of lemon juice and adding more to taste based on tartness preference. Pour over bread, slice, and serve. I used three light 6 x 3.5 x 2 inch mini loaf pans for my bread because I like to gift some whenever I bake. As written, this recipe yields 3 small loves at about 7-8 slices per loaf. You can also use one light 9 x 5 inch loaf pan and adjust bake time to 45-55 minutes. If using a different sized pan, transferring to muffin tins, or using glass/dark loaf pans you'll want to adjust the bake times to suit. Glass bakeware cooks more quickly while darker bake wear causes bread to brown darker/faster so you may want to drop the oven temp by 25 degrees F to compensate. If making muffins out of the batter, they cook faster so start checking them around the 20 minute mark. Bread may be wrapped tightly in plastic wrap and stored for up to 4 days. You can even freeze it! Enjoy leftover bread as is or warm it up in the toaster oven or microwave until fluffy and warm. Enjoy! Nutrition facts below are calculated without optional glaze. Estimate provided by an online nutrition calculator.